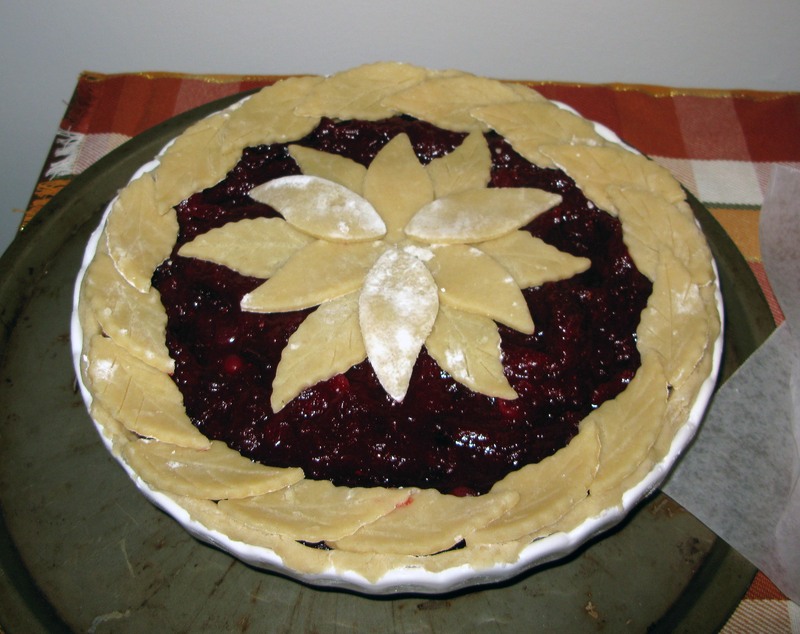 How to Make a Poinsettia Pie Crust | I Wanna Bake! For my last two pie crust tutorials (leaf borders and roses), I showed you how to make leaf shapes using only a round cookie cutter. You could still do that for your poinsettia, but I’m going to strongly recommend that you get yourself a set of leaf-shaped cookie cutters for this one. This decoration uses several different sizes of leaves/petals, and the cutters will make it a whole lot easier to make your sizes distinct and consistent. I used this set of 2-sided fondant cutters, and I liked that they made it easier to distinguish between the leaves and the petals (scalloped side versus smooth side). I did have some trouble with uneven browning on this one, which makes sense considering how many different sizes of decoration pieces were involved. I used pieces of aluminum foil to cover the parts that browned quickly, and it helped a little, but I did have to take the pie out of the oven earlier than I might have preferred to prevent outright burning. To combat this, I would suggest baking the poinsettia in two pieces: the larger bottom part already attached to the pie, and the smaller top part on its own on a cookie sheet. The smaller part will bake faster, so you can just take it out of the oven when it is completely browned and leave the rest of the pie in there to finish on its own. Once the pie is cool, you can attach the top part of the poinsettia to the bottom with some corn syrup mixed with water (or just lay it on top and remove it when it’s time to cut the pie). I haven’t tried this myself, but I think it should work out pretty well. If anyone tries it, let me know how it turns out. 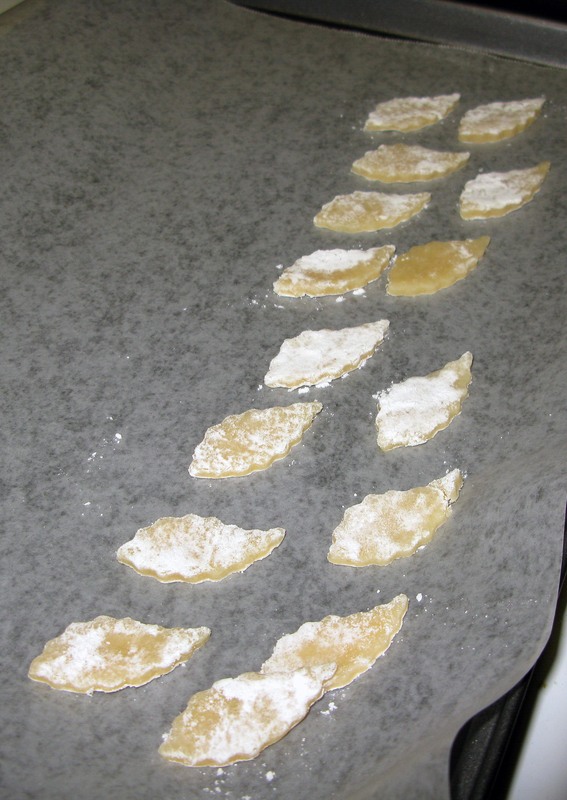 Line a cookie sheet or large plate with waxed paper and set it aside. 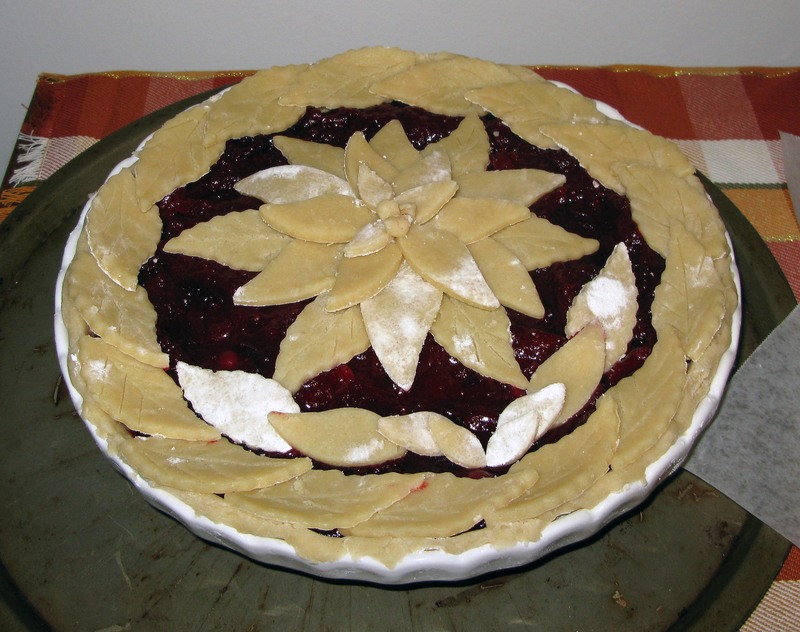 On a lightly-floured surface, roll out your pie crust until it is about ⅛”-¼” thick. Using your leaf-shaped cookie cutters or glass, cut out 6 large leaves, 6 slightly smaller petals (I used the cutter two sizes down), 6 petals slightly smaller than the previous set (two sizes down again), and 3 more tiny petals. If you’re making a leaf border as well, cut 20-30 additional leaves, plus a few more just in case. 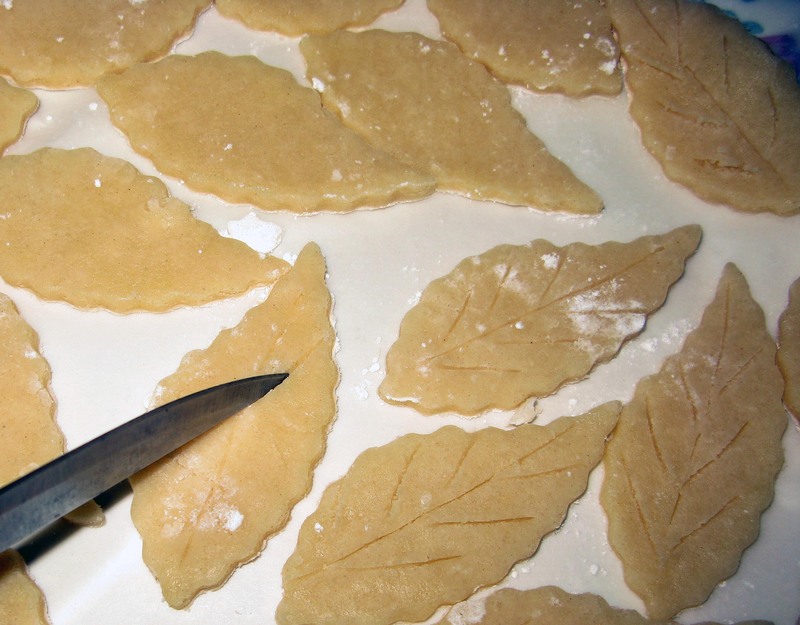 Transfer your leaves and petals as you go to the cookie sheet or plate and make veins using the back of a sharp knife on the leaves. 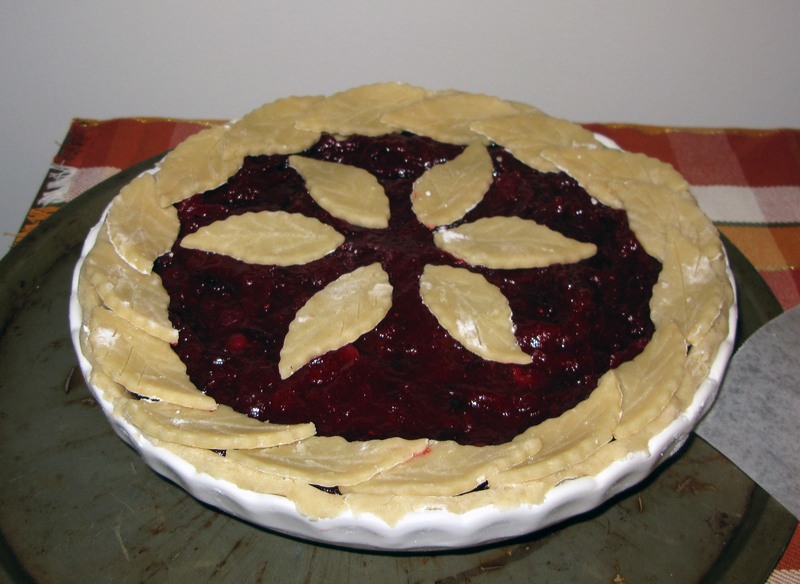 Refrigerate the crust pieces for 20-30 minutes before arranging them on your pie. If you’re using a leaf border, add that first so that you know how much space you have to work with for your poinsettia. Next, arrange 3 of the large leaves in a trefoil with about an inch of space between them in the center. Place the remaining 3 large leaves in between the first 3 to form a 6-pointed star. Using 3 of your next-largest petals, arrange another trefoil on top of the leaves, overlapping so that the petals lie in between the leaves. As you did with the first layer of leaves, arrange the remaining 3 petals of this size between the first 3 to form a 6-pointed star. Using the next largest set of leaves, arrange a 6-pointed star on top (or do this separately on a cookie sheet lined with foil). Finally, arrange the smallest 3 petals on top of the flower in whatever arrangement looks nicest. 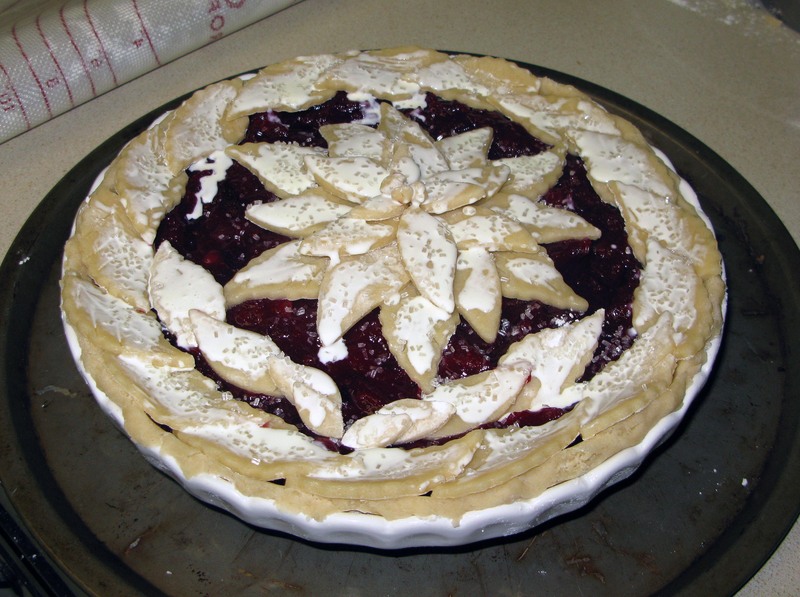 I also made 3 balls of pie crust to add to the center to finish it off. If you have leftover leaves and enough space, you can add a laurel for a little extra flair. 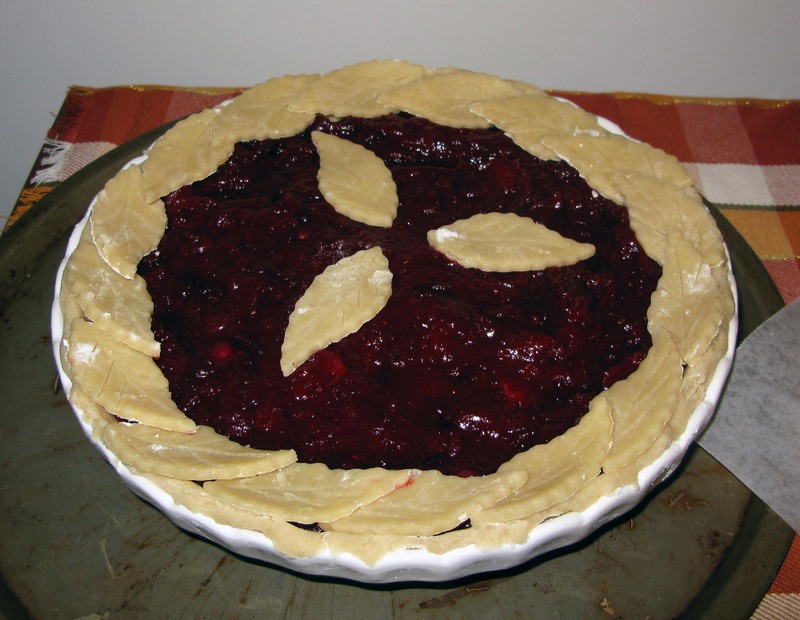 Put the pie back in the refrigerator while your oven preheats according to the recipe. Cold crust is key to preserving the shape of the decorations and preventing melting, so don’t forget this part. 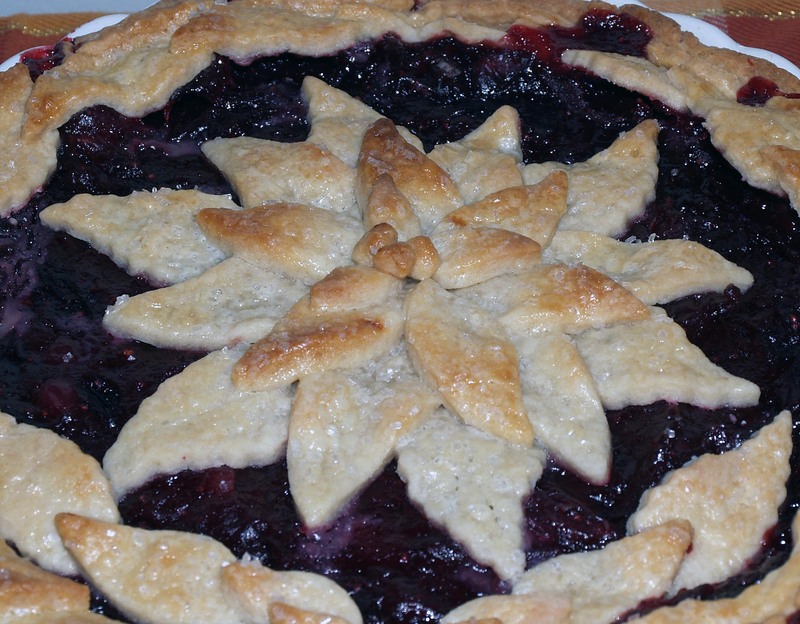 When the oven is ready, take the pie out of the refrigerator and carefully brush the top crust with heavy cream, rearranging the leaves and petals as needed if they shift out of place. Sprinkle the top with decorating sugar if desired. Baking the pie according to the recipe, checking after 20 minutes to check the top crust for brownness. If it is already looking brown, place some pieces of foil loosely on top of the brownest parts for the rest of the baking time. If you want to change it up a little, you can add some colored sugar before baking to make the poinsettia extra festive (or repurpose it as a different flower for a different season).